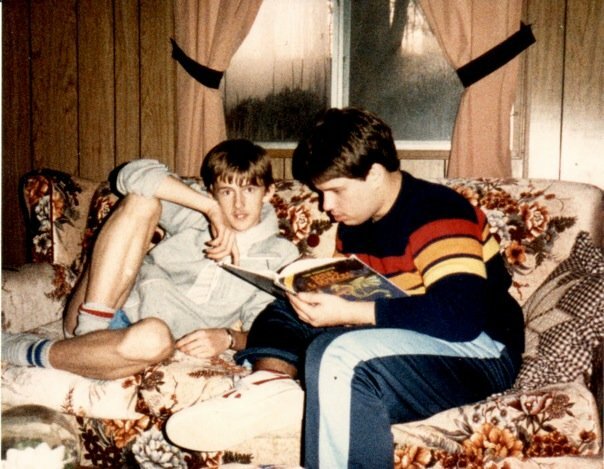 You and Steve Magan, circa 1985. First of all, Happy Birthday! June 15th, 1985. It's going to be a crazy year. How do I know? Oh, I'm you, 30 years in the future. No. Sorry. No flying Deloreans. No hoverboards (though I hear they're close). We also don't have newspapers, for the most part. I'm sure there are 80s retro-diners around somewhere, though, and our phone technology went through the roof! Hard to explain, but let's say they make tricorders look like WWII self-cranking radios. On the upside, we didn't blow up the planet, so that's something. It's been a while since I've done a personal post, mostly because of wonderful flood of writing work. It is way overdue for a life update. From the Depths: 5th edition conversions of aquatic races, new archetypes for the core classes designed for aquatic settings, and discussions of aquatic adventures for a range of systems and genres. Rich's Gameroom: New classes, archetypes, races and more for 5th edition play, as well as discussions of non-5th edition material. Behind the Screen: Discussions of houserules, DMing and Playing techniques, system-agnostic discussions and more. I'll also be interviewed on the gaming podcast, "Dungeon Master's Block". The recording is this coming Friday the 23rd of January, but I don't have a release date yet. I'll update this post when I find out. At the beginning of last year, I tore a ligament in my shoulder. After two months of "light duty" I had an MRI that confirmed the damage. It took almost six months of appointments, diagnostics, surgery, and rehab, but I'm finally back at the hospital working. Luckily, I still have "light duty" time available. Between the back injury in 2013 and the shoulder injury in 2014, I've decided that I've done all I can as a bedside nurse and it's time to move on to something new. I've applied for a number of positions in the hospital, including working closely with the EPIC electronic medical record team, and I'm hoping to start a new position before I permanently injure myself. I'm also looking into going back to school for a Masters degree. How that will affect my work and writing, I'm not sure, but moving away from hands-on work is an imperative. It will be sad to leave my unit. My coworkers in the CCU at UCSD are the most professional, intelligent, caring, and skilled individuals I've ever worked with. Our management is top-notch and the opportunities for nurses to influence the workings of UCSD Medical is seemingly endless. I couldn't have asked for a better place to start my nursing career. The downside is that I kind of started at the top. Another unit wouldn't be as satisfying, even if the physical work was less, so I will need to continue my work elsewhere. As some of you know, we are expecting a little brother for Rowan in a few months. I'm incredibly excited about this, but also apprehensive about the significant lack of sleep for the next year or so. Rowan and her mother are the lights of my life and it's hard to imagine that I would have enough love in my heart for yet another amazing being, but I've been assured that my love is bottomless and little Grayson will simply make more of it available. I can't wait. On the home-front, we're adding a guesthouse to our property. It's taken a while to get the permits and construction going, but we're hoping to have it finished in the next few months. Stay tuned here for more information on the already-exciting happenings in 2015!